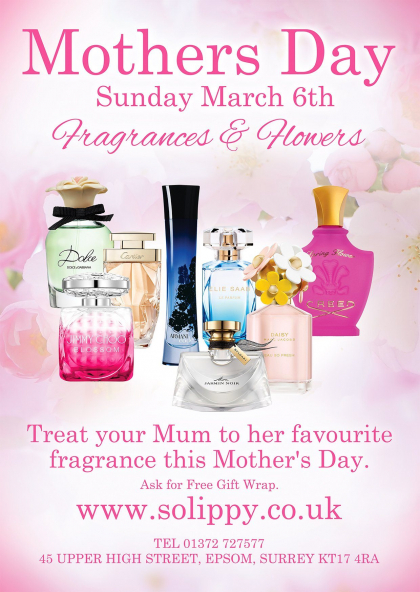 Yes Mums day is nearly here, and for that very special person in our lives we want to give her a treat. She may like to try many of the new fragrances around – something different. Does she want a day wear fragrance or a night time? Or does she long for a particular perfume – one which reminds her of a special day or time. Ask a woman what perfume she wore on her wedding day and she’ll probably remember – ask a man about his after shave (let’s not go there). Despite the massive range of fragrances available – sometimes it can be difficult to get a particular one – especially if it’s not current. The team at So Lippy in Epsom know that. They have built themselves a range of trade contacts who they can call on to find that elusive aroma. But it’s not just old fragrances they can provide, they offer the latest perfumes and aftershaves at great prices, together with a range of delightful gifts.